The Topps Company has announced the 46th annual Topps Major League Rookie All-Star Team, released today following balloting by Major League managers. The National League dominates this year�s team as it represents eight of the 10 positions. Both the Colorado Rockies and the Pittsburgh Pirates each have two players nominated to the team. Joe Mauer of the Minnesota Twins and Daniel Cabrera of the Baltimore Orioles are the lone American Leaguers. Pittsburgh�s Jason Bay was a unanimous selection. The Topps Major League Rookie All-Star team began in 1959 with Willie McCovey being the first of 13 future Hall of Famers named to the squad (others include Johnny Bench, Rod Carew, Gary Carter, Carlton Fisk, Paul Molitor, Joe Morgan, Eddie Murray, Tony Perez, Kirby Puckett, Tom Seaver, Ozzie Smith and Billy Williams). 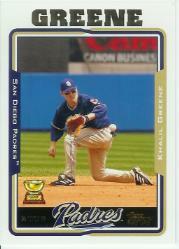 The Rookie All-Stars each have a trophy on their 2005 card in Topps Baseball, with Series One currently on store shelves.